Our Massachusetts Hepplewhite lolling chair is very shapely and both sophisticated and successful in its scale and proportion. The richly grained mahogany is shaped and molded on the arm supports and tapering front legs, exactly like the original. 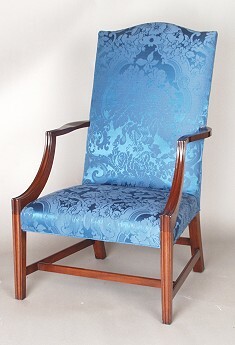 This handsome chair is easily used either in the home or in a commercial environment where high back seating is desired.